Sewage treatment—an unglamorous backbone of urban living—could offer a cost-effective way to combat climate change by flushing greenhouse gases from the atmosphere. In an article analyzing several possible technical approaches in the journal Nature Sustainability on Dec. 18, 2018, researchers at Princeton University concluded that sewer plants serving municipalities worldwide offer a major option for capturing carbon dioxide and other greenhouse gases. Although cautioning that research and development is needed before the systems could be deployed, the team identified several potentially viable paths to using sewage as a carbon sink—that is, sewer plants could clean the atmosphere as they clean water. "The water industry could play a big role in tackling climate change," said senior author Jason Ren, professor of civil and environmental engineering and the Andlinger Center for Energy and the Environment. "It is a very exciting idea because people always think about energy or transportation, but water has not been considered as a major factor in carbon reduction." 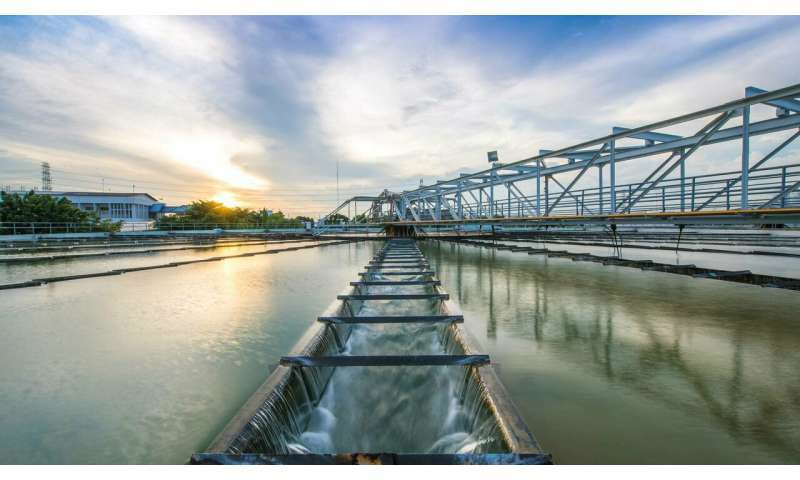 In the past few years, researchers have proposed methods to use that wastewater to capture enough carbon to offset the amount generated to power heavy equipment used to run sewer plants. They discovered that some techniques not only would allow the plants to balance their own emissions (cleaning water requires considerable energy use), they could also absorb extra carbon that operators pumped into the sewage as it moved through the plants. "If you consider it as a resource, you could convert part of the waste material including the CO2 into products," Ren said. "You could actually make money." Generally, the operators would use pipes to pump carbon dioxide gas into the sewer water in the plants. They would then use a variety of techniques to convert the gas into carbonate minerals, biofuels or a sludge-based fertilizer called biochar. This techniques uses a combination of bacteria and a low electrical charge to change the water's alkalinity and, with the addition of silicates, convert carbon dioxide to solid carbonate and bi-carbonate. In addition to the solids, which can be used by industry, the process creates large amounts of hydrogen gas. The researchers noted that this technique is currently used in the laboratory and additional work is needed to show whether it is economical and applicable at the industrial level. Microbial electrosynthesis is similar to the microbial electrolytic technique except that the process relies on bacteria to directly capture carbon dioxide and convert it into other organic compounds such as ethanol or formic acid. The researchers noted that the technology is promising but major breakthroughs are needed to fully develop the process. Microalgae cultivation could be used as a complement to other processes. Algae and bacteria use the carbon dioxide, nitrogen and phosphorous in the wastewater to grow. Operators then harvest the algae, which can be used as animal feed, for soil treatment or in biofuel production. The researchers said work is going forward on identifying the best local microbial communities, small and intensive bioreactors, and efficient techniques for separating solids and liquids. This method converts wastewater sludge and microalgae into material that improves soil's ability to retain water and nutrients. The technique, which removes pathogens, is usually self-sufficient in terms of energy, although most biochar is now made from dry plants. The researchers said using wastewater sludge to make biochar may require more energy or additional steps to account for the additional water content. Ren said that in many locations, sewer plants are already located near industrial facilities that emit large amounts of carbon dioxide such as power plants, cement factories and refineries. He said using the sewer systems to capture the carbon could provide an economic return for these companies in the form of carbon credits. He also said the technique could be used by industries that already run their own wastewater treatment systems such as oil and gas producers, brewers, and distillers. When analyzing the potential environmental and economic benefits of such operation, they found millions of tons of CO2 could be captured and utilized, while billions of dollars in revenue could be generated in both the U.S. and China, the world's two largest CO2 emitters. The researchers cautioned that while many techniques are promising, "the concept is still in its infancy." They said that full use of the technology will require work of not only scientists, but also regulators, investors and industry. Jerald Schnoor, an engineering professor at the University of Iowa, said national leaders should consider wastewater treatment as part of efforts to decrease the country's carbon footprint in coming decades. "Wastewater treatment is one of the largest energy users and greenhouse gas emitters of a municipal spreadsheet," said Schnoor, who was not involved in this research. "Technologies exist at pilot scale to achieve zero carbon and energy footprints, but they are not proven to be scalable or cost-effective at the current time. As the country now embarks on 'green infrastructure' initiatives, as being discussed by the new Congress, this should be a high priority."